In my classes, I demonstrate Pure Contour Drawing, describing how to use the method as I draw — if I can manage to keep talking (an L-mode function) while I'm drawing. Usually, I start out all right but begin trailing off in mid-sentence after a minute or so. By that time, however, my students have the idea. Following the demonstration, I show examples of previous students' Pure Contour Drawings. See examples of students' drawings on page 95. • Several pieces of drawing paper. You will draw on the top sheet and use two or three additional sheets to pad the drawing. Woman in a Hat, Kimon Nicolaides. Collection of the author. "Merely to see, therefore, is not enough. It is necessary to have a fresh, vivid, physical contact with the object you draw through as many of the senses as possible— and especially through the sense of touch." Please read through the following instructions before you begin your drawing. right-handed and the right if you are left-handed. Bring your fingers and thumb together to create a mass of wrinkles in your palm. Those wrinkles are what you are going to draw— all of them. I can almost hear you saying, "Are you joking?" or "Forget that!" 2. 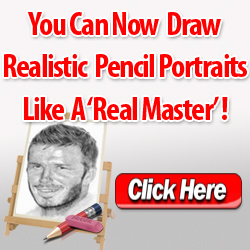 Sit in a comfortable position with your drawing hand on the drawing paper, holding the pencil and ready to draw. Then, put the pencil down and tape the paper in that prearranged position so it won't shift around while you are drawing. 3. Set the timer for 5 minutes. In this way, you won't have to keep track of time, an L-mode function. 4. 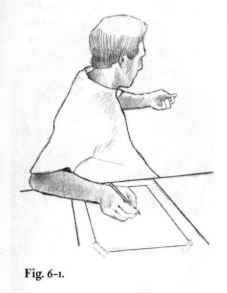 Then, face all the way around in the opposite direction, keeping your hand with the pencil on the drawing paper, and gaze at the palm of the other hand. Be sure to rest that hand on some support—the back of a chair or perhaps on your knee — because you will be holding this rather awkward position for the allotted 5 minutes. Remember, once you start to draw, you will not turn to look at the drawing until the timer goes off. See figure 6-1. 5. Gaze at a single wrinkle in your palm. Place your pencil on the paper and begin to draw just that edge. 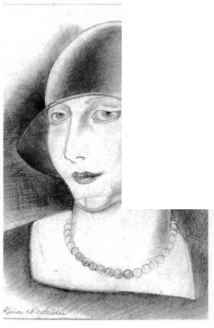 As your eyes track the direction of the edge very slowly, one millimeter at a time, your pencil will record your perceptions. If the edge changes direction, so does your pencil. If the edge intersects with another edge, follow that new information slowly with your eyes, while your pencil simultaneously records every detail. An important point: Your pencil can record only what you see—nothing more, nothing less—at the moment of seeing. Your hand and pencil function like a seismograph, responding only to your actual perceptions. The temptation to turn and look at the drawing will be very strong. Resist the impulse! Don't do it! Keep your eyes focussed on your hand. Match the movement of the pencil exactly with your eye movement. One or the other may begin to speed up, but don't let that happen. You must record everything at the very instant that you see each point on the contour. Do not pause in the drawing, but continue at a slow, even pace. At first you may feel uneasy or uncomfortable: Some students even report sudden headaches or a sense of panic. 6. Do not turn around to see what the drawing looks like until your timer signals the end of 5 minutes. 7. Most important, you must continue to draw until the timer signals you to stop. 8. If you experience painful objections from your verbal mode ("What am I doing this for? This is really stupid! It won't even be a good drawing because I can't see what I'm doing," and so forth), try your best to keep on drawing. The protests from the left will fade out and your mind will become quiet. You will find yourself becoming fascinated with the wondrous complexity of what you are seeing, and you will feel that you could go deeper and deeper into the complexity. Allow this to happen. You have nothing to fear or be uneasy about. Your drawing will be a beautiful record of your deep perception. We are not concerned about whether the drawing looks like a hand. We want the record of your perceptions. 9. Soon, this mental chatter will cease, and you will find yourself becoming intensely interested in the complexity of the edges you see in your palm and intensely aware of the beauty of that complex perception. When that change takes place, you will have shifted to the visual mode and again you will be "really drawing." 10. When the timer signals the allotted time, turn and look at your drawing. "Blind swimmer, I have made myself see. I have seen. And I was surprised and enamored of what I saw, wishing to identify myself with it "
Think back now on how you felt at the beginning of the Pure Contour Drawing compared to how you felt later, when you were deeply into the drawing. What did that later state feel like? Did you lose awareness of time passing? Like Max Ernst, did you become enamored of what you saw? When you return to the alternative state you were in, will you recognize it? 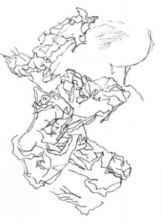 Pure Contour Drawing is so effective at producing this strong shift that many artists routinely begin drawing with at least a short session of the method, in order to start the process of shifting to R-mode. Looking at your drawing, a tangled mass of pencil marks, perhaps you will say, "What a mess!" But look more closely and you will see that these marks are strangely beautiful. Of course, they do not represent the hand, only its details, and details within details. You have drawn complex edges from actual perceptions. These are not quick, abstract, symbolic representations of the wrinkles in your palm. They are painstakingly accurate, excruciatingly intricate, entangled, descriptive, and specific marks—just what we want at this point. I believe that these drawings are visual records of the R-mode state of consciousness. As a witty friend of mine, writer Judi Marks, remarked on viewing a Pure Contour Drawing for the first time, "No one in their left mind would do a drawing like that!" The most important reason for this exercise is that Pure Contour Drawing apparently causes L-mode to "reject the task," enabling you to shift to R-mode. Perhaps the lengthy, minute observation of severely limited, "non-useful," and "boring" information— information that defies verbal description—is incompatible with L-mode's thinking style. • Your verbal mode may object and object, but eventually will "bow out," leaving you "free" to draw. This is why I asked you to continue drawing until the timer sounds. • The marks you make in R-mode are different from and often more beautiful than marks made in your more usual L-mode state of consciousness. • Anything can be a subject for a Pure Contour drawing: a feather, a piece of shredded bark, a lock of hair. Once you have shifted to R-mode, the most ordinary things become inordinately beautiful and interesting. Can you remember the sense of wonder you had as a child, poring over some tiny insect or a dandelion? How to use contour drawing drawing to draw anime?